A basic questionnaire between a potential employer and potential employee to the company is considered as a great way to get to know the candidate much better. Asking insightful questions for a job interview is a brilliant way to understand how the thoughts of the person sitting in the front are. It will also help in understanding what they can bring to the business. But asking common interview questions to a group of individuals which are standard enough will provide answers similar to the other or rehearsed ones. So it would be time to take a step higher. When the interviewer asks the candidates insightful questions, it in turn encourages the candidates to provide prompt answers. They tend to give their answers in a form of providing life examples. The candidates also start beginning to feel much safer, before and while they are answering. They may also start to think that they should give the answer that the interviewer expects to hear. They will also have to first start thinking whether or not the question is a behavioral interview question type and then provide an answer accordingly. Mentioned below are certain insightful interview questions to ask potential employees which are mainly asked at job interviews along with a description regarding why are they asked? When preparing for an interview process it will be very helpful. 1. Can you tell me a time when you made a decision in your workplace which resulted to be a mistake? This question will describe the real character of the candidate in the workplace. Discussing about a past error means much more than talking about a past success. Talking about past successes mainly brings out a positive enthusiasm, but discussing a past failure or error is difficult to forget. If the person starts beginning to feel shy, maybe they weren’t able to fix that mistake or they cannot admit that they went wrong. The main thing to understand through this question is that how they felt and coped up after this mistake, how responsible they were and whether or not they solved it. And eventually it can be understood whether or not they learnt from it. 2. What kind of concrete criticism did you receive last and how were your reactions? This question will provide the interviewer with a proper insight whether or not the candidate’s previous employer had asked them to improve on something or not. This question can also have a further follow up question such as “How have you gone since bringing in this change?” Then the interviewer can properly understand whether or not this individual can take criticism whenever they go wrong and improve the way of their work. 3. Did you come across a time at work when you had to make a difficult choice? The candidate’s interview response will show the interviewer what the actual thought process of the candidate actually is. It will also help in knowing that when a tough decision was to be made in the workplace, how they handled it. The response provided by the candidate will depend on the position that is being offered to them. Their answer may be entirely based on logic or it can be based on how they look for getting positive results out of it. 4. Have you ever come across with disagreement in the decision given by the manager? What did you do at that moment? This is one of the most common questions in an interview where the interviewer should expect a surprising as well as interesting response. It may show two different answers. One may show that the candidate is entirely committed towards showing respect and following all the rules and regulations in the workplace. The other side may show signs of showing initiative and efforts made for the manager to change their decision and improvise on their way of thinking. This could show that this candidate has an intelligent mind and has all the necessary decision making skills whenever needed. 5. What is the most exciting prospect of this job? This question will at once bring to the interviewer’s attention, the candidates who are genuinely interested in the rewards other than the actual job itself. At this moment this cannot be considered as a bad thing. If the role that is being offered is target-driven and so for such positions one of the motivations mainly comes as a monetary reward. So at this moment putting the reward ahead of the job would exactly be the answer the interviewer wishes to hear. At least they will know that the candidate is willing to work hard for it. The basic quality that the employer will identify through this question is leadership. They will realize whether or not this particular candidate would be advisable to have as one of their company’s head leaders in the future. Past leadership experiences will have taught the candidates something vital about leadership. The interviewer will also understand whether the candidate looks to lead by example or just loves giving orders and having people under them. Co-ordination and co-operation is very important for a smooth functioning of the entire organization. If one person also isn’t willing to co-operate then the entire chain will break down and things won’t function properly. The candidate may have come across such a person who wasn’t willing to co-operate with the others present in the workplace. How they handled such a situation should be described to the interviewer. They will also get a basic idea whether or not this person can be trusted in the future if such a situation comes in his way. Leadership doesn’t just come naturally, it comes with experience. Certain events or chances come across the way of selected candidates for them to show off their leadership skills. The candidate will describe an event if occurred in the past where they had to show their leadership. And later on they will have to mention how this opportunity affected their overall life. If certain opportunities similar to this are provided by the new company, then the interviewer can realize that this person would fit perfectly for this role. We all have a hero or a role model in our lives at some point that has changed the thoughts of our lives entirely. This is a wonderful question to ask any candidate as this question may sound mainly like a personal and a friendly question. The candidate would also be very open to discuss about this person as it would be someone very near and dear having a positive influence over him. On describing this individual, the interviewer will also understand that the candidate also aspires to achieve great success as this person. Every workplace has some kind of negative influence always lying within itself. There are certain people jealous of their other co-workers and try to affect their lives in a negative way so that they don’t progress forward. If the candidate has gone through such a situation before, then it is a great thing to share with the interviewer. The interviewer will understand that if such a situation once again comes across the candidate, they will be able to handle it properly. They will be able to overcome it in a successful way without any inconveniences. 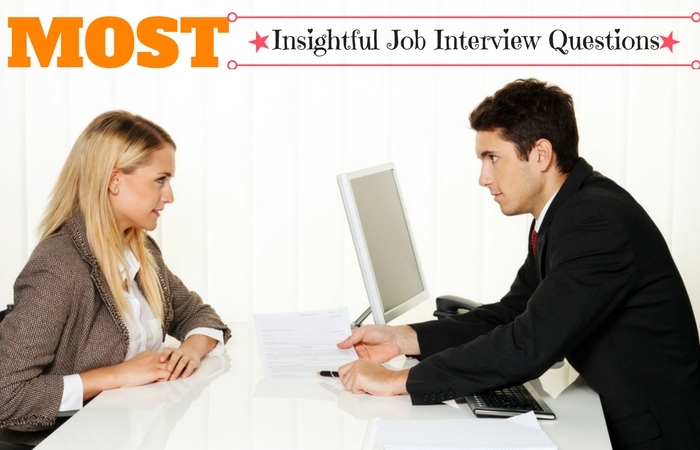 For this question, the interviewer will also have to provide a specific example along with the question. The example may just be something random or it may be something which is currently on-going in the workplace or in a different workplace. Giving an on the spot situation will show the interviewer whether or not the candidate can use their presence of mind at the right time. And if they can find a solution to the problem quickly then the interviewer will understand that such a candidate will be reliable for any emergency situation in the future. This question is going one step further. If the interviewer starts realizing that this person is perfect for the job but still want to see how much more confident they can be then such a question can be asked. It will basically describe the communication skills that the candidate possess for getting their idea heard. Such a skill is really important to have while working with a team. And skill can only be driven by passion. If the person is passionate about their job then they will answer it well and so this passion will also be identified by the interviewer. This question will make the interviewer realize and understand 3 important qualities within the individual. Whether they have self-awareness of how good they are, how optimistic they are in life and how much positivity they bring along with them. This will describe their overall ability of how they will perform their job. Through this question, the interviewer will also understand whether the candidate is a person who knows that he is the best and whether or not they are willing to be a member of the team. This would be a great question to be considered if a person is being interviewed for a position referred to sales with customers. The interviewer will come to know how honest the candidate really is. When it is the mistake of the candidate whether or not they will admit it and apologize or whether they will start justifying their case. If the person is humble and honest then it will be recognized by the interviewer. Though such a question will sound strange but after all it is just an example with a true meaning hidden behind it. Asking such a question the interviewer will only understand whether the candidate can explain such a concept in a simple or complex manner. If the explanation is simple then the concept has been entirely understood by the candidate. If it is complex then still work is required. This is a great way to actually understand whether or not the person has understood any of the concepts explained to them earlier. This is another personal type of question which could be an annoying, asked at the time of a business interview. The answer to this question may replicate to where the candidate sees themselves after a certain period in their life. So it is really important that such a question is answered very wisely. This is a question which already has a future plan associated with it, if the person has been chosen as a future employee. The correct insightful questions in job interview process can prove to be highly beneficial for both the interviewer and interviewee. Both are strangers to one another before and during the interview. Once they begin their conversation then the good job interview questions asked can actually make them more comfortable with each other and start building a relationship with one another. The interviewer will also be benefited as they can understand the behavior and qualities of the candidate in a much better way. And if the candidate answers every question properly then they will be the first person under consideration for this post.